There is nothing more elegant and eye-catching than the piercing blue of a sapphire gemstone, especially in contrast to brilliant white accent diamonds on a platinum background. That’s why 2018 is going to see an upswing in the popularity of sapphires. To purchase the most dazzling gems of the highest quality and get the most noteworthy pieces possible, you must first know a bit about sapphires. The word sapphire is a derivative of the Greek term “sapherios” and the Latin term “saphirus,” both of which mean “blue.” There is also a connection to the planet Saturn, as the word sapphire translates to different terms associated with the planet Saturn in many languages. Sapphires are the birthstone for the month of September and first became a coveted gemstone in 800 BC. Ancient rulers at the time believed that the blue sky was modeled by the Gods to replicate the sapphire stone, making them a holy artifact. They have been long revered by the Catholic church, ancient Persians, and other religious factions because of their association with the heavens. Sapphire rings have long been a symbol of royalty, dating back as far as the 12th century. While this traditional representation was more common in the past, it has been carried on into modern times. For example, Prince Charles presented Princess Diana with a sapphire engagement ring. The sapphire has long been a symbol of joy, health, and prosperity. The best way to assess sapphires is to acquire loose sapphire gemstones. As most consumers are more interested in purchasing a completed piece rather than a custom crafted one, this isn’t always a possibility. Fortunately, you can still assess a gemstone in a setting. Assessing sapphires follows the same criteria as GIA’s 4 Cs for assessing diamonds. You must look at the clarity, color, carat, and cut. When assessing cut, you want to look at the shape, the smoothness of the edges, the number of light-catching facets, and the symmetry of the stone overall. When assessing clarity, you will want to keep your eyes peeled for inclusions. Inclusions are spots of imperfection within the stone. While you do not want too many inclusions in a stone, one or two can help verify that the stone is real. Ideally, your stone will have inclusions that are invisible to the naked eye and only noticeable when magnified. Color refers to the shade and saturation of the sapphire. How pure does that shade of blue look to you? Color is the most important part of assessing a sapphire and blues are rated in quality, from good, better, best, to heirloom, which is the best overall. You can also seek a sapphire that fits your personal preference here, by choosing a darker or lighter shade of blue. Carat refers to the size and weight of your stone. The larger the stone, the larger the carat and the higher the price as bigger stones can be challenging to procure. Sapphires are usually found in mines in Africa and southern Asia. However, there is also a mine in Montana in the United States of America. While looking closely at your gemstones is highly recommended, it is also a good idea to get a certification of authenticity from the selling agent. You’ll want to be sure to do your due diligence in researching highly regarded sellers before making a purchase. With sapphires once again becoming more coveted and popular to adorn, one might wonder what piece would suit them best. It ultimately depends on what style you wish to convey and how noticeable you want your piece to be. 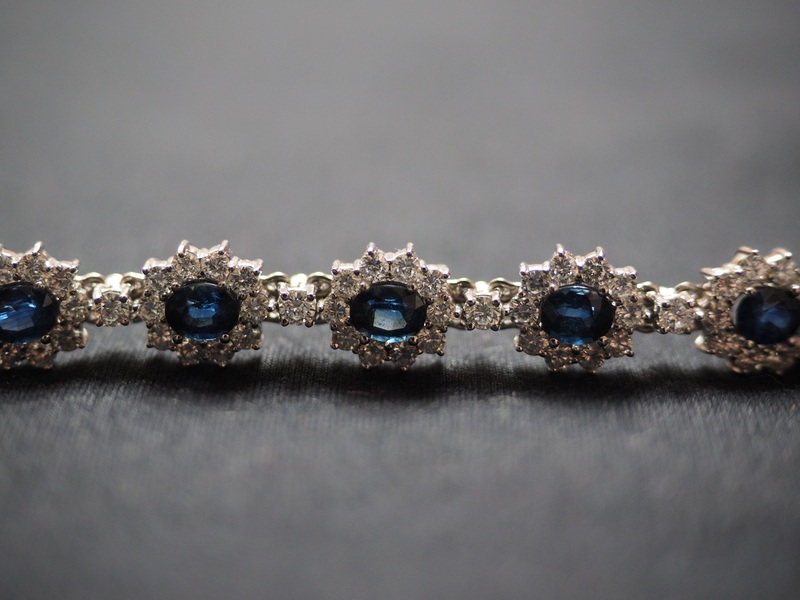 A broach is a fabulous, functional way to show off your sapphires in combination with other gemstones. A bracelet takes a daintier approach and adds a touch of high fashion. Earrings can be a subtle way to show your love of these blue gemstones on a daily basis. Or maybe you’ll just wait for the ring from that special someone. In that case, be sure to leave this page up on your browser as a subtle hint.